Labelexpo Southeast Asia debuts at BITEC in Bangkok, Thailand on May 10-12. Aimed at printers, brand owners, technicians, buyers and designers, the show is expected to attract visitors from Thailand, Malaysia, Indonesia, Vietnam, Singapore, the Philippines, Japan, South Korea and Australasia. Supported by the Thai Screen Printing & Graphic Imaging Association (TSGA) and the Department of Industrial Promotion (DIP) under the Minister of Industry, the event will cover over 3,500sqm of floor space and host some 150 exhibitors. As with all other Labelexpos, the show floor will feature live machinery demonstrations and a host of different technologies on display. Labelexpo Southeast Asia will also offer a variety of educational opportunities, including a two-day conference and two workshops in association with the Label Academy. Armor will introduce inkanto as a new brand for its thermal transfer offering in Southeast Asia. inkanto comes with a new visual identity as well as enhanced services such as a newly introduced lifetime guarantee and 2D barcode that connects customers back to Armor. Berhalter will show die-cutting machines that can be used for paper labels, for example beer and IML labels, as well as flat packaging lids made from aluminum or polyester, such as Nestlé yoghurt lids. 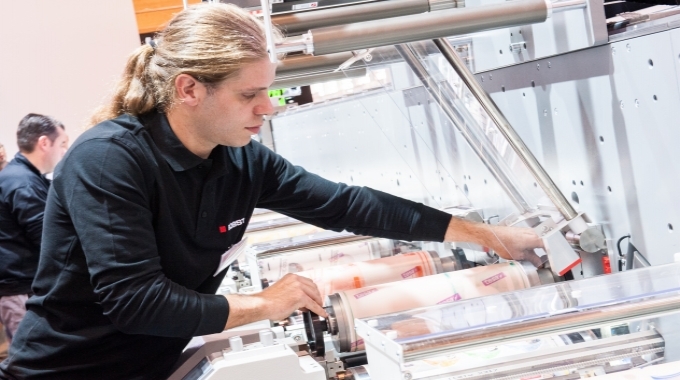 Bobst will display the M1 flexo press with daily printing and in-line converting demonstrations. This press was launched at Labelexpo Europe 2017, configured with mechanical line shaft and laser pre-register and automatic register. Visitors will also be able to discuss CI flexo and gravure printing presses and laminators effective for mid to wide web short run production, as well as the Bobst range of silicone, adhesive and pre/ post coating lines and vacuum metallizing systems. Brotech will demonstrate its CDF330 digital finishing system, equipped with a flexo unit for varnish, coating, cold foil, semi-rotary die-cutting, slitting and conveyor stacking on non-modular system. It can be configured for roll-to-roll or roll-to-sheet label converting. Alongside its standard web guiding products, BST eltromat Southeast Asia will show its PowerScope 5000 and TubeScan Digital Strobe 100 percent inspection systems. BST eltromat Southeast Asia will show its product range of quality assurance systems for the web processing industries. Visitors can see the web monitoring system PowerScope 5000, a selection of web guiding products such as CompactGuide, and systems from the TubeScan range, such as TubeScan eagle view with the new QLink workflow. PowerScope 5000 is a web viewing system providing the print operator with a clear, sharp image with easy navigation across the web via the intuitive multi-touch screen user interface. TubeScan Digital Strobe is available in web widths from 180mm up to 1100mm, and web speeds from 150 to 400m/min. BTS Industries will showcase blank and pre-printed labels, security labels and tapes, specialty labels, thermal transfer ribbons, barcode printers from Zebra, Citizen, TSC, and other scanners and accessories. Dow Corning will showcase Robond Invisu PS-7910, which builds on Dow Adhesives’ expertise in water-borne adhesive technologies for self-adhesives filmic labels. This adhesive is a water-based acrylic adhesive polymer with proven runnability on high productivity curtain coating equipment. Edale will promote its narrow web flexo presses for printing and converting labels and packaging, with emphasis on the Edale AiiR technology for autonomous inking, impression and registration. It comprises a high-resolution end-of-press camera system, Bobst will run live demos of the latest M1 press at the show Edale registration software, print mark sensors and seven independent motors positioned on each print station. AiiR adjusts the print impression and inking and brings the print into register without the need for operator intervention. For the first time in Southeast Asia, Epson will show its new SurePress L-4533AW digital label press. The easy-to-operate press allows short-run label printing with accurate color reproduction on a wide variety of substrates. Flexo Wash will demonstrate anilox and plate cleaning machines. Three divisions of Flint Group will join forces on the show floor: Narrow web, Image Transfer Solutions (Flexographic Products) and Xeikon/ThermoflexX. Xeikon will demo its Xeikon 3500 press in a roll-to-roll configuration for packaging and label applications. Graphtec Corporation will show digital label printing machines Labelrobo LCX1000 and LCX603 alongside auto sheet feeder F-Mark. LCX1000 comes with DLP1000 digital label finisher with functions of laminating, free-shape cutting, matrix removing, slitting and rewinding. LCX603 delivers high-durability three-color printing, laminating, contour cutting, matrix removing, and slitting. F-Mark is an automatic sheet feeder for the Graphtec cutting plotter CE6000 Plus. Harn Engineering will show samples printed on a Domino N610i digital UV inkjet label press. Domino has formulated UV90 ink set for use with this press which is EuPIA and Swiss Ordinance compliant and has improved adhesion across range of standard substrates, thus, reducing the need for in-line priming. Harn Engineering will also promote the Domino K600i White digital print module inkjet system, targeted primarily at printers looking for a digital alternative to screen printing. 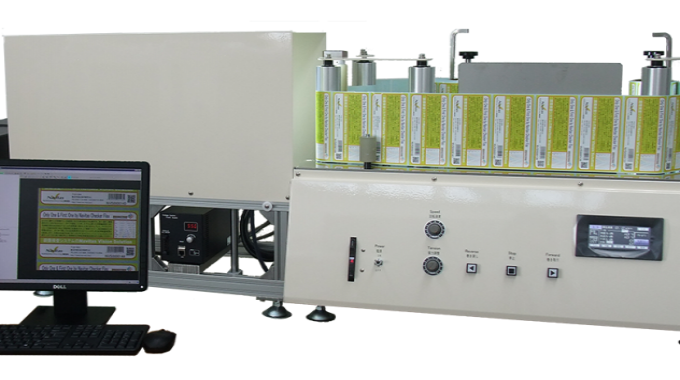 Hitachi High Technologies will showcase the LAB-X5000 SRF for analysis of silicone coat weight. Its features include streamlined user interface, large industrial grade touch screen, high resolution detector, and one-touch measurement start. It handles single and double sided coatings applied to a range of paper, film, fabric and other substrates. HP Indigo will show the recently launched 6900 digital press. Based on HP’s narrow web platform with 1,400 units operating worldwide, it includes all Indigo’s top-line innovations to print any label job of any run length. The innovations include Pack Ready for Labels for the production of high-resistance labels; new HP Indigo ElectroInk Silver, now commercially available, which delivers metallic effects across a wide color gamut, including Pantone colors; and integration with the HP Indigo GEM embellishment unit, the first fully digital, one-pass label printing and embellishment system for spot, tactile, foil, holograms, mini textures and lamination. IST Metz will showcase the MBS range with its standard hot swap functionality that enables users to switch between UV lamp technology and LED technology at any time during the production process. During the switchover, the outer housing remains in place on the machine. The Lampcure unit can be exchanged for a LEDcure system designed in the form of a cassette. Contact to the supply connections is created automatically by the insertion process. Jiangsu Wampolet High Tec will show topcoated direct thermal paper and direct thermal films. Konica Minolta will showcase the AccurioLabel 190 digital label press, which offers 1,200 DPI image quality at a printing speed of 13.5m/min, and FDA standard toner. KPowerScience will show Winjet’s compact digital color label system. Users can design graphics and die-cut files, print, install printed web on finisher, and die-cut on this machine. Kurz will focus on its Trustseal Decorate and Trustseal SFX products. While Trustseal Decorate allows color changes and 3D effects onto a product; the pseudo-plastic character of Trustseal SFX creates spatial effects and appears to rise from the surface. Lintec will showcase new products including easy-to-apply and bubble-free labelstocks, labelstocks for oily surfaces, and ultra-low migration labelstocks. 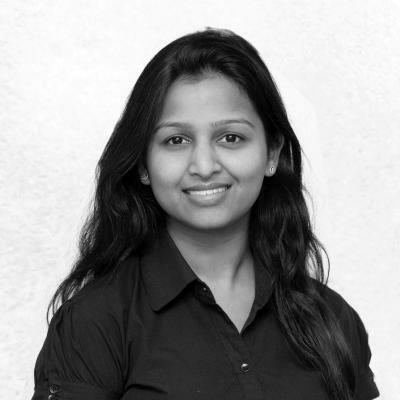 Monotech Systems will promote the various products under its in-house brand, Jetsci. The company will focus on track and trace capabilities, its newly launched Colornovo digital label press, Polyonics will showcase ESD-Safe polyimide and PET labels, tapes and films Labelexpo Southeast Asia | 69 hybrid full color inkjet system, and variable data inkjet printing, slitter rewinder and inspection system. Nagase Thailand, distributor of Asahi Photoproducts in Southeast Asia, will showcase its principal’s AWP-DEW water washable flexo plate system featuring Clean Transfer Technology. Visitors will also be able to see printed application examples. Professionals from Asahi will be available to discuss plate requirements and benefits of fixed color palette printing. Navitas Vision Solution will show NaviLab-Lite, a compact roll label inspection system with a maximum feeding and rewinding speed of 50m/min. It comes with 3-CMOS color line scan camera. Nichiei Thailand shows an anti-mosquito label equipped with citronella oil to repel insects. The product can be supplied directly to OEMs, in which case it can be customized to include other insect repellent ingredients. Other products on display include a weather-resistant label aim at motorcycle applications. Nilpeter will demonstrate the new FA-Line printing press alongside a variety of equipment from its partners, including Trojan Label, Lundbergtech, Pamarco and Grafotronic, among others. Nova Inter Tech will introduce screen and flexo engraving technology from German machine manufacturer AKK, as well as high mesh rotary screens from Uniprints for rotary label printing. Omet will show an iFlex press with 10 UV flexo colors and a 370mm (14in) web width, running at a maximum speed of 190m/min and printing repeat from 5.5in to 18in. It can print with different technologies, such as UV flexo, UV LED or water-based and rotary screen printing, with in-line die-cutting (repeat from 8in to 24in). The press' compact but ergonomic design requires low maintenance and minimum spare parts, while its short web path minimizes start-up waste. Phoseon Technology, a manufacturer of patented LED technology, will focus on its new FirePower FP601 and FireJet FJ601 systems for film and flexible packaging applications. While FirePower FP601 cures at 300m/min and have water cooling capabilities, FireJet FJ601 air-cooled product range provides simple integration and high-power 16W/sq cm at 395nm for the retrofitting individual press stations. Polyonics will show ESD-Safe polyimide and PET labels, tapes and films that comply with the S20.20, IEC 61340 and JESD625B standards and are safe to use in ESD control plans. The materials have static dissipative top surfaces and low charging PSA and liners. The materials are proven to protect the most sensitive ESDS devices from electrostatic charges arising from both human contact (HBM) and charged devices (CDM). Pulse Roll Label Products is participating alongside its exclusive Thai partner, Press Systems. It will perform live demos of PureTone UV flexo ink mixing and color matching to showcase the benefits of the total color management system for narrow web label printers. PureTone FPC ink system is available for non-direct food contact packaging and labeling applications. 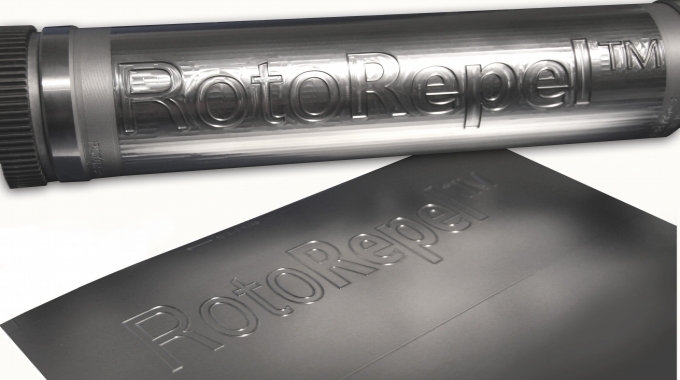 RotoMetrics will show RotoRepel no-stick treatment for flexible dies and solid rotary dies. Its technology minimizes adhesive build-up and transfer, and improves die performance. The die does not chip or flake and maintains blade profiles. RT Supply will display silicone coated and anti-static coated plastic release liner films that can be used for labels, adhesive tapes, die-cutting, and hydrocolloid adhesive medical tape. Seal King Industrial will show tamper-evident security labels, security tapes for security bags, and packing tapes. Phoenix Pulp & Paper, a subsidiary of SCG Packaging, will show paper products for label applications. The company will focus on glassine paper with smooth surface for optimal silicone coating and transparency suitable for automatic labeling systems. Rhyguan and its local representative, Press Systems, will showcase TOP-330 Twins multi functional label converting and finishing equipment as well as Kiss-330 flexo varnishing with flatbed tooling. Stic-on Papers will launch digital self-adhesive labelstock targeting digital printing applications both in paper and filmic labels. Both pigment and dye-based inks work well on this product. Toyobo will showcase water-washable flexo plate Cosmo Light, which can be washed in tap water with a small amount of mild detergent. It eliminates the usage of hydrocarbon and hazardous solvents. Plates are press ready within an hour. Cosmo Light enables resistance with water-based, alcohol-based, UV flexo and solvent inks. Toyo Corporation will showcase a hole punching machine for label and sticker with auto image processing positioning. 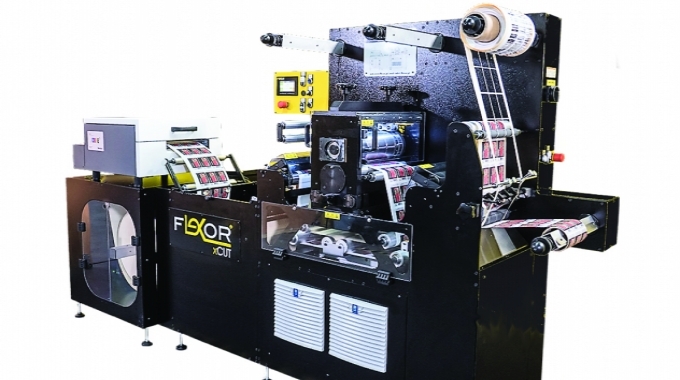 Tradeally International, exclusive distributor for Flexor in Asia, will display xCut, a ‘plug and play’ machine that can print, laminate, die-cut and convert in one pass. The system is compatible with any printer. It can covert at 18m/min and produce blank labels at 24m/min with precise semi-rotary die-cutting. The company will co-exhibit will Print-on-demand solutions (PODS), which offers a digital label printing machine with Memjet technology. Troika Systems will show its AniCAM with Anilox QC products which measure the surface profile of anilox ink metering rolls, sleeves and plates used to deliver the correct density of ink to the packaging material to be printed. Troika products check the integrity of the rolls and plates before a print run to ensure good quality print output, efficiency and accuracy capturing the data and automatically collatingit into easy-to-read reports with graphics for analysis. Tsukatani will focus on its flexible Pinnacle die that can be used for labels, packaging, and envelopes. TTR Euroworks will showcase thermal transfer ribbons, thermal print heads, TTO printheads and ribbons, dye sublimation ribbon, hot foil, PIY ribbons, fabrics and printheads. UPM Raflatac will display its latest self-adhesive labeling materials for various end uses, including food, beverage, logistics, home and personal care, pharmaceuticals and healthcare, and more. Univacco will show its latest developments in hot stamping foils, sheet-fed offset cold foils, holographic foils, and narrow web cold foils. Newly released is Narrow Web Cold Foil CF4.6R-A, said to provide excellent transfer at high printing speeds with straight lines and sharp edges for both text and graphics. CF4.6R-A is applicable on flexo, letterpress and web-offset machines. Vinsak will showcase Vinsak USAR 430 modular slitter rewinder and VRL 400 Vinsak roll lifter. The USAR comes equipped with die-cutting unit and VIS 1200 inkjet system as well as 100 percent inspection system. VRL 400 is a manual reel lifter which can carry reel with a maximum weight of 400 Kgs with width of 1000mm. There will also be a live demonstration of Vinsak security software. In addition, visitors can get more information on Lombardi Synchroline flexo presses and Lead Laser’s DLE systems. Zeller+Gmelin will present low migration Uvaflex FCM Y81-series of inks for printing on food packaging and labels. The low-migration UV flexo inks are claimed to offer a high degree of migration safety and feature low odor. The formulation of the new ink series dispenses with BPA-containing raw materials. It is therefore suitable for printing labels, folding boxes and flexible packaging in the food sector.